We’d love your help. Let us know what’s wrong with this preview of Southern Discoveries by Tracey Clark. Makayla can’t believe that her life has been reduced to this… asking the flighty office girl for help. Could Marin As far as Marin knew, Makayla thought of her as a waste of space, so why the invite to lunch? Curiosity killed the cat… Marin just hopes that this time curiosity doesn’t kill the Finder. Could Makayla be a Fae assassin hiding in bitchy-southern-bell clothing? Quaidin Lari wants to get in, finish his mission, and get out. Anything to get back to Out-realm and as far from Earth-side Kentucky as possible. His band of mercenaries - the Fianna - have one goal… to locate Marin, the highly sought after Fae Princess, and see to her protection. As the Incubus on the squad, he needs to focus on persuasion and manipulation. To ask other readers questions about Southern Discoveries, please sign up. This story picks up where Shocking Finds left off, full of anticipation and me biting my nails. These are not stories that you read in a sitting, they take concentration because they are so detailed and thorough. They are easy to get sucked into though, they are beautiful and fun and a great way to delve into a world full of wonder. Marin is still having trouble accepting who she is to this new world she has only just discovered. She is surrounded by people trying to help her but danger of cours This story picks up where Shocking Finds left off, full of anticipation and me biting my nails. These are not stories that you read in a sitting, they take concentration because they are so detailed and thorough. They are easy to get sucked into though, they are beautiful and fun and a great way to delve into a world full of wonder. Marin is still having trouble accepting who she is to this new world she has only just discovered. She is surrounded by people trying to help her but danger of course lurks around every corner. She has a hard time figuring out who to trust. She has the mind set of helping everyone, but can she do that without putting herself in danger? Southern Discoveries by Tracey Clark is book two in the Finder’s Keepers series flows smoothly from Shocking Finds. This is not a book that can be read before or without reading the first book. Marin is still trying to figure out how she fits into this new Fae world and her role as princess. Makayla, a co-worker at Finders, comes to Marin for help. Makayla isn’t one of Marin’s fans, so it surprises her that she asks for help finding her brother. 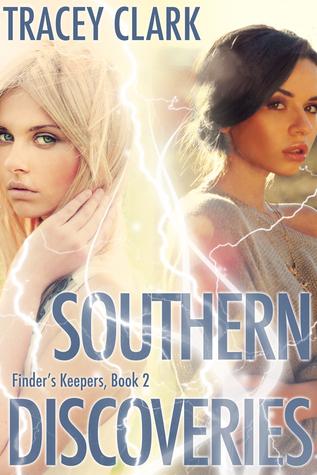 A relationship grows between Makayla and one of Ma Southern Discoveries by Tracey Clark is book two in the Finder’s Keepers series flows smoothly from Shocking Finds. This is not a book that can be read before or without reading the first book. Marin is still trying to figure out how she fits into this new Fae world and her role as princess. Makayla, a co-worker at Finders, comes to Marin for help. Makayla isn’t one of Marin’s fans, so it surprises her that she asks for help finding her brother. A relationship grows between Makayla and one of Marin’s protectors Quaidin. Marin and Kyland’s relationship continues. He is her protector and continues to teach her about her powers. There is still a lot going on questions are answered, and more questions arise. The author creates angst, passion, emotion, mistrust, and sadness for the reader. I like the pace of this book a little more than book one. While there are still some sluggish sections, I didn’t feel the need to re-read as much as I did in book one. I’m still interested in finding out more about this Fae world and look forward to the next book by Tracey Clark. Tracey enchanted me with the first book in this series, Shocking Finds, and she has continued to do so with this second one. Intrigue and suspense continues on in this one - but there are two other characters that add to the story, Makayla LePine and Quardin Lari. The story picks up where Shocking Finds finished, so you really MUST read that one first. Marin is still coming to terms with the fact that she is a Fae Princess with some amazing powers. Her transition into this new world is not an easy one for her. She must learn who she can and cannot trust. Marin's journey of self-discovery is one that constantly tests her, but she manages to keep her ground and her dignity wth everyting that she does. She is an exceptional young woman and a role model to all those who will read her story. But will her self-discovery put her own life in danger? I am absolutely loving this series, and I cannot wait to see where Ms Clark takes future books in this series. She has captured me totally. This is the second book in the series and should be read in order. Marin the newly found Fae princess is struggling to control her growing powers. Makayla LaPine works for the same Finders business as Marin but she is one of the human employees. She has been trying to find her missing twin brother, there is only one person left to ask for help. They woman she has always been nasty to. Quadin Lari and his team have come to help protect the princess. He didn't expect to find a woman who seems immune to his charms. A woman he can't resist. Ok so this is the second book in the series and let me say it doesn't disappoint. So now we know marin is the lost fae princess. Marin is still trying to figure out who she is and who is on her side. Makayla has always been super nasty to marin but must eat her words and ask her for help. She needs marin to help her find her brother. Enter quaidin the super hot incubus!! He is in charge of keeping marin safe. When he meets the one woman he can't keep out of his mind and is immune to his gift , h Ok so this is the second book in the series and let me say it doesn't disappoint. So now we know marin is the lost fae princess. Marin is still trying to figure out who she is and who is on her side. Makayla has always been super nasty to marin but must eat her words and ask her for help. She needs marin to help her find her brother. Enter quaidin the super hot incubus!! He is in charge of keeping marin safe. When he meets the one woman he can't keep out of his mind and is immune to his gift , he has to have her. This is a scorching read, with an awesome storyline. Once you pick it up , you won't be able to put it down. I am a country-twang gal from the bluegrass state. Kentucky is a hot bed of horses, cave systems, and whiskey. And I love all three. With my pugs and bossy kitty cat, I spend my days writing and working social media. I write with the help of the voices pushing me to create worlds for them to live in. Fantasy Romance, Contemporary Romance, and eventually some cowboys (because cowboys live in a grou I am a country-twang gal from the bluegrass state. Kentucky is a hot bed of horses, cave systems, and whiskey. And I love all three. With my pugs and bossy kitty cat, I spend my days writing and working social media. I write with the help of the voices pushing me to create worlds for them to live in. Fantasy Romance, Contemporary Romance, and eventually some cowboys (because cowboys live in a group all there own, yummmm) are the genres that I love best. In 2005, a serious case of Multiple Sclerosis ended my higher education as I strived to finish my mathematics degree, wiping away all my beautiful numbers and a large portion of artistic talents that I had taken for granted most of my life. After a few years, my beautiful words started to come back to me. Filling my days and nights with imagined worlds helped me to cope with my newfound reality. I am currently working with Mary (my publisher) at http://gonewritingpublishing.blogspot... Each day I find that getting sick has helped me to find my passion.